On March 7th Kijani team members Dickens and Daniel were accompanied by a surveyor from the Kenya Forest Services (KFS) for a 3rd visit to the North Marmanet forest. Inside this degraded forest in Laikipia County, central Kenya, Kijani will re-plant 250,000 indigenous trees on 100 hectares. The purpose of this trip was to identify the GIS (or geographic) coordinates for this effort. KFS grows grows exotic trees such as pine and cypress for farmers in Marmanet. 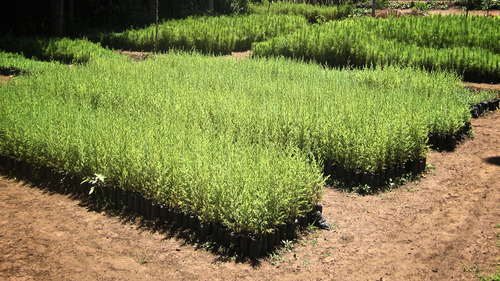 Kijani will plant indigenous trees that grow slower, but are better for rehabilitation. The boundary between the forest land and the local community was not difficult to identify. Cultivated earth interspersed by mud houses and little children running up and down the slopes summarized the sight of the nearby village, Kwanjiku. Adjacent, scrub, grassland, introduced trees and small patches of prime indigenous forests completed the horizon far into the distance of the hilly landscape. A stretch of the eastern boundary of the North Marmanet forest. 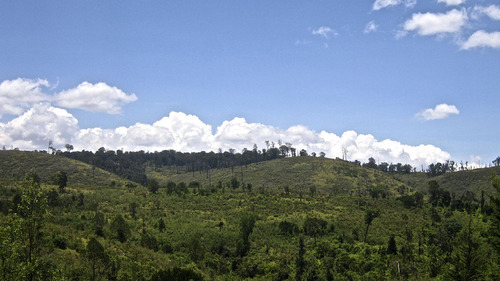 Pictured on the hill to the left are pine trees planted by KFS. 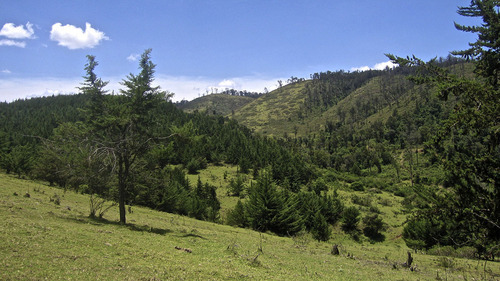 Although it is called a “forest”, North Marmanet is more of a protected area. The original forest has all but disappeared. Steady deforestation coupled by forest fires and the government relocation of the Kalenjin community to the region in the 1980’s reduced the 4600 hectare forest to less than 10 hectares (KFS, 2013). Today, the landscape is only partially covered by trees, many of these exotic species introduced by KFS in an attempt to rehabilitate the forest. Despite this evident destruction, it is still a relief to see that not all of the magnificent landscape is this region is overwhelmed by agriculture, and that efforts are being made – spearheaded by KFS – to plant trees again. The primary forest is still intact in small corners of Marmanet. This oasis survived because of the steepness of the slope which makes it difficult to cut down the trees. North Marmanet is managed by a KFS team of six rangers, armed with AK47 rifles, and a Forest Manager – Lucas. It was Lucas who guided our walk through the forest. He quickly gave us a brief history of the region. He started with an explanation of the ethnic diversity. It is a place where you can find members of the Turkana, Samburu, Kalenjin and Kikuyu tribes. He explained that this ethnic mix is attributable in part to the relocation of loyalists to former President Daniel Arap Moi in the 1980’s. Moi’s master plan was to swing the provincial presidential vote majority in his favor. It worked – in fact; similar antics contributed to his 22-year presidential tenure. He only stepped down as president in 2002. Lucas pointing out the forest boundaries to Daniel and Jobita – the KFS surveyor. Two KFS rangers accompanied us are shown in the foreground. 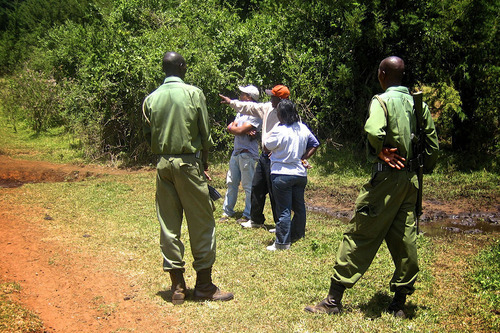 Lucas also explained the problems KFS has experienced with elephant poaching. In fact, the rangers carry AK-47’s primarily to combat poachers. 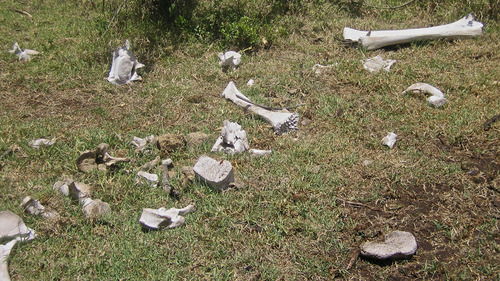 Although instances of poaching have been rare in recent years, we walked past several skeletal remains of massacred elephants. Freshwater streams and abundant salt licks make Marmanet suitable for elephants to raise their young. Poaching occurs every few years, as evidenced by these skeletons. Lucas also told us why the community set parts of the secondary forest on fire in 2003. Disgruntled community members – dissatisfied with the efforts of KFS to rehabilitate the forest at the expense of the rights of the community to graze and collect firewood – set ablaze tens of hectares of secondary forest (i.e. trees planted by KFS). Lucas said that since he started his work as Forest Manager 3 years ago, the relationship with the community has improved. This was evident from his positive reputation in the community. He is known and respected, and the community has a greater understanding of the benefits of a healthy environment. He says that community members need to be directly involved or *employed *in the conservation efforts, if they are to have any sense of ownership for it. Because of these reasons, Kijani will employ 3-4 members of the local community to manage its tree nursery. It will be operational in a few weeks. 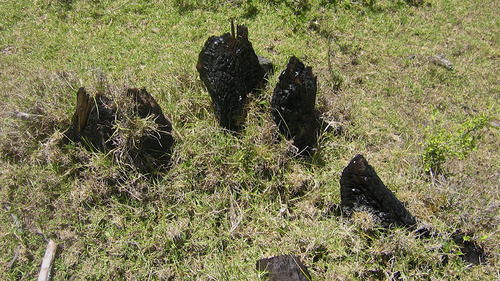 A burnt tree stump: a remnant of the forest fire of 2003, where KFS suffered a major setback to its reforestation efforts. The key to Lucas’ positive repertoire with the community has been working through the local Community Forest Association (CFA). Through focus group meetings, KFS has been able to sensitize the community, explain its government sanctioned mandate – to restore tree cover in Kenya to 10% by 2030 – and find compromises to community interests. The community is now allowed partial access to the forest for firewood, and cattle are allowed to graze in select locations. Lucas also explained that as a government institution, KFS acknowledges that partnerships are key to achieving its mission. 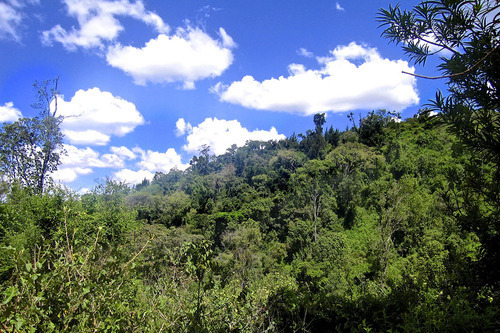 KFS simply does not have the resources to accomplish 10% tree cover in Kenya. This is where organizations such as Kijani can come in and help. The synergy between Kijani and KFS is evident. It lies in the fact that we will help each other to achieve our respective goals. KFS is sanctioned to plant trees. Kijani, on the other hand, wants to plant trees, but in a way that is sustainable. That is, by empowering local communities through sustainable business and integrating the community into the reforestation model. KFS will provide Kijani will the on-the-ground expertise, security and connections to the community to make this vision a reality. Kijani, on the other hand, will help to boost forest cover in Kenya through tree-planting projects – 100 hectares at a time. This will help the government achieve its goal of 10% tree cover in Kenya by 2030. The goal of this trip, to identify the 100 hectares for Kijani’s first project – and the location for a tree nursery to make this happen – was accomplished. 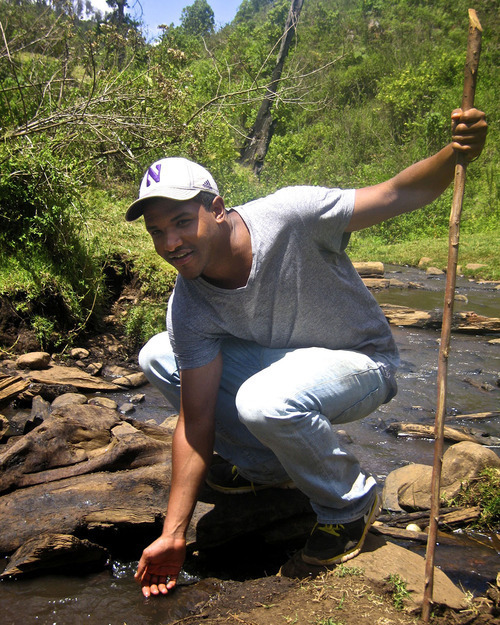 Lucas identified a stretch of land where several small rivers – such as the Melwa and Mukuru wa Gitore – crisscross. This will guarantee a stable water supply. This location is also near to a KFS forest station. This will guarantee oversight for the work at the tree nursery. Jobita – the surveyor from KFS – used her GPS tracking device to identify the coordinates of this land. She will send us an aerial map of these 100 hectares, which will be included in the “Memorandum of Agreement” (MOA) with KFS. This MOA will also formalize the lease agreement – tentatively of 30 years. A view of North Marmanet from the eastern boundary. “One step at a time”, I told myself during the 300 km, 800 m descent back to Nairobi – with mesmerizing views of Mount Kenya off to the east. “One step at a time”.